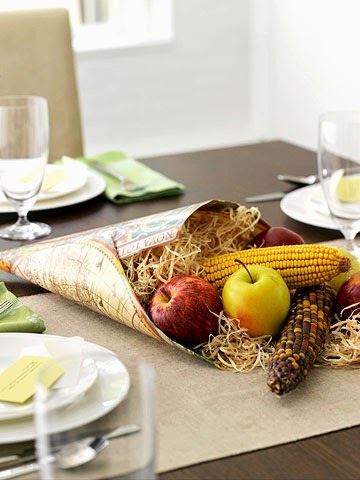 Add color and texture to your harvest table with a cornucopia spilling over with apples, dried corn, and shredded paper. Craft your own by folding a sheet of gift wrap or decorative paper into a cone shape and securing the edges with tape. 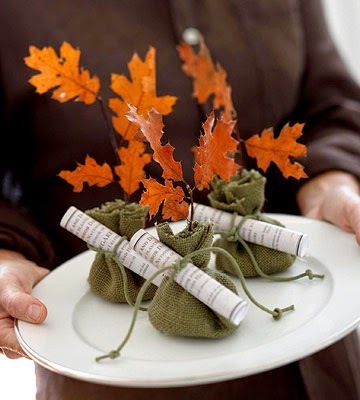 Say "thank you" to your guests with a favor of a tree planted in their honor. (Arborday.org offers the service.) Present the certificate tied to a fallen or dried leaf twig wrapped in burlap. 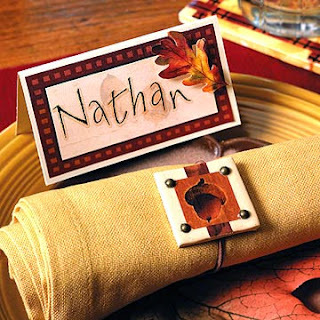 Turn a Thanksgiving dinner table into something special with these ideas that take only a few minutes to make. Hot-glue cloves, star anise, and leaves to a small pumpkin or gourd to make a fragrant place card. Fill a white container with white and yellow mini pumpkins resting on a bed of colorful fall leaves. 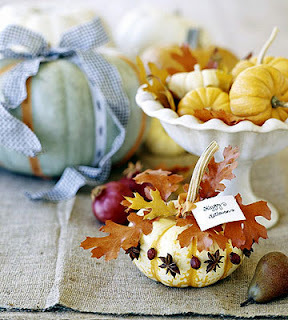 Top a pale green pumpkin with a bright gingham bow. Beneath the bow, crisscross thin ribbon in colorful rows down the pumpkin. Add a homey touch to your holiday table with these fall-theme tabletop accessories. Thanks to purchased press-on lettering and crafts clay, no special skills or equipment are required. Use the same ribbon that match and coasters, shown below, for a matching tablescape. Protect your furniture with these festive fall coasters, perfect for guests to use while enjoying Thanksgiving drinks in the living room. 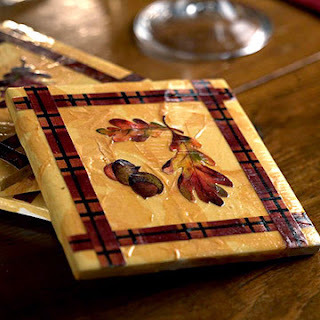 Tear yellow tissue paper into small pieces and adhere to a plain ceramic tile using decoupage medium. Let the glue dry slightly before adding border, leaf, and acorn stickers. When the glue is completely dry, coat the piece with acrylic glaze. Add adhesive felt circles to the bottom of the tile to prevent it from scratching surfaces. Place your favorite harvest-scented candles inside glass votive cups and wrap the vessels with tamale-making husks (available at grocery stores). Soak husks in warm water for a minute to make them flexible. 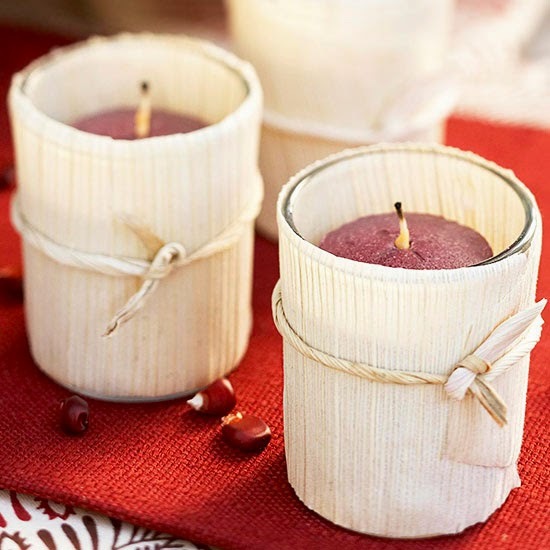 Tightly wrap a husk around a votive cup and hold in place with a rubber band. Trim excess husk at the top and bottom. Twist a thin length of husk and tie it around the center of the candleholder; remove rubber band.